Ted Cruz, a Harvard-educated lawyer and Tea Party icon, easily won the U.S. Senate race Tuesday night, becoming the first Hispanic from Texas to land the job. Cruz had a huge, insurmountable lead in early returns. In early statewide returns, his total was slightly behind Republican presidential nominee Mitt Romney's total, but the gap represented a relatively low number of split ballots. Romney was beating President Obama by more than 15 points with about 85 percent of the precincts reporting, according to early unofficial returns. The outcome of the U.S. Senate race was never much in doubt. Democrats haven’t won statewide in Texas since 1994, and Democrat Paul Sadler had so little money — about 5 percent of what Cruz raised — that he couldn’t even afford to run a single TV ad hitting all media markets. Sadler conceded before 9 p.m. in a brief address to supporters. At that point Cruz was winning 57 percent to 40 percent. About a half hour later, Cruz took to the podium at a jubilant victory celebration in Houston. He said he had gotten a "gracious" phone call from Sadler and told the cheering crowd he was the next senator from Texas. "What a journey we have been on together. What an incredible, magical journey," Cruz said. "They said it was impossible. They said it couldn’t be done, but when the people stand together nothing is impossible." Cruz, a domestic policy adviser on George W. Bush’s 2000 presidential campaign and solicitor general of Texas from 2003 to 2008, is considered a brilliant legal scholar. But this will be his first job in elective office. The son of a Cuban immigrant, Cruz was considered a long shot when he got into a crowded Republican primary that included the deep-pocketed Lt. Gov. David Dewhurst. Cruz began that race on a shoestring budget and focused for months on building relationships among a far-flung network of Tea Party activists who came to make up the campaign’s most die-hard supporters. They relied largely on social media and candidate forums to spread their message, hoarding their campaign money for TV ads they knew they could not run until the final few weeks of the race. 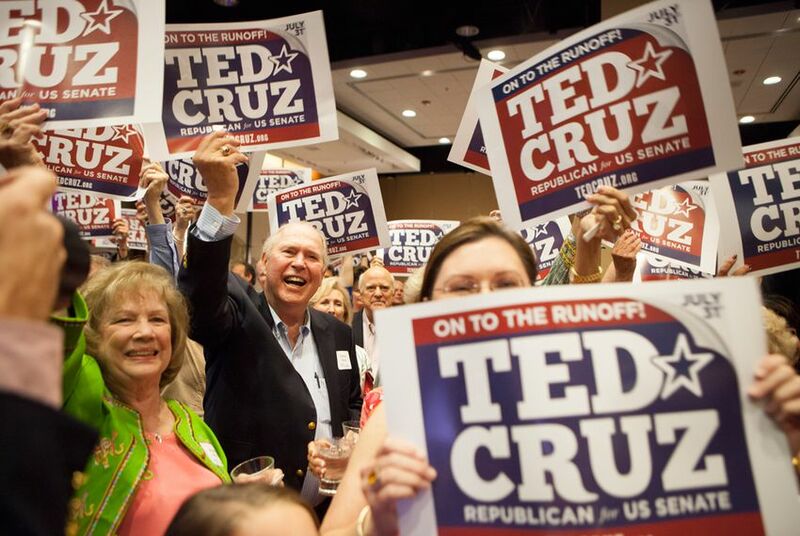 Cruz’s defeat of Dewhurst in the July 31 runoff shocked the political establishment and set the stage for Cruz’s easy victory Tuesday night. Sadler’s runoff with political novice Grady Yarbrough drew little interest by comparison, and only a fraction of the millions showered on the Republican primary. A former state representative from East Texas, Sadler attempted to portray Cruz as an extremist who was out of step with mainstream Texas, even at the risk of coming across as strident and angry. In one Texas Tribune interview, Sadler took issue with Cruz's Canadian birth and his ties to Washington, saying, "He needs to go back to Washington where he’s from, or Canada, because he doesn’t reflect us." Later, in a debate, Sadler called Cruz a "troll," a comment he later said he regretted making. But Sadler, like a trail of Democrats before him, got almost no traction in the electorate and even less among donors. The latest campaign finance reports show the Democratic lawyer raised $600,000, compared with some $14 million raised by Cruz. Cruz will join a growing cadre of Tea Party Republicans who are determined to scale back the size of government and reduce the debt. Drawing on lines from his stump speech, Cruz warned that the United States was going down the road of "European socialism," and he promised to do everything he can to stop it. Cruz vowed to fight President Obama unless he changed his ways. "If he is re-elected and intends to continue down this same path, then I will spend every waking moment to led the fight to stop it," Cruz said.